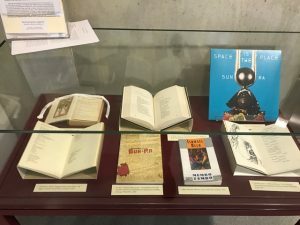 The CMT Gallery showcases interesting texts, objects, projects, and other news from around the CMT community, offering librarians and researchers a forum in which to share information about their activities. The most current Gallery feature is shown below - for older entries, please use the menu below. RECLAIMING THE LEGENDS: MYTH & THE BLACK ARTS MOVEMENT finds inspiration in the anti-historical world described by Wright. Its mysterious dance is the “cabinet of curiosities”: the defiance of categorical boundaries, the assembling of varied objects, the powerfully mythic rather than the historical, the rhythmic rather than the calculated. The exhibition also “plead[s]” like Wright’s dance. It asks visitors to abandon traditional epistemologies and participate in the microcosm it has created. 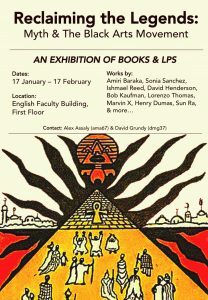 This exhibition-world is a miscellany of anthropological & egyptological studies, revisionist histories, spiritualist & esoteric writings, books of poetry, and music record. It intimates some organizational principle, but finds time operating synchronically. Traditional chronology, here, is corrupted: Amiri Baraka, Sonia Sanchez, Lorenzo Thomas, Bob Kaufman, Ishmael Reed, David Henderson, and Marvin X appear alongside Gerald Massey, George James, and Theodore P. Ford. Like Wright’s dance, its form is ritualized and its theme is mythical. Following Ra, the exhibition’s second display case ( LOOKING AHEAD, VISIONARYWISE) positions itself in the future. On the left hand side of the display case, the visitor sees three texts that explore the theme of death bringing about new life. E.A. Wallis Budge’s translation of The Book of the Dead  contains a series of “magic spells” with the capacity to determine the afterlife of the deceased. In “Egyptian Book of the Dead” (1970) , David Henderson uses metaphors like magic spells to transform a deceased New York City into an Edenic ancient Egypt. In his ode to the legacy of Malcolm X (1968) , Marvin X turns Malcolm’s assassination into something affirmative, bringing with it strength, hope, blackness, and black power. While death brings about new life, myth and magic provide models of what that new life may look like. Reed’s “Neo-HooDoo” mixture of fact and fiction, history and myth, in Mumbo Jumbo (1972)  provides the reader with an aesthetic and cultural model antithetical to the West’s. In “The True Way to Life” (2006) , Sun Ra uses intuitive logic to reinterpret history, decode biblical scripture, and reveal the secret path to everlasting life. In Four Black Revolutionary Plays (1968) , Amiri Baraka provides examples of how sensationalism, surrealist symbolism, and mythology can be placed in the service of political protest. The exhibition ends with two explorations of what may be called the future-present. In “to Morani/Mungu” (1971) , Sonia Sanchez puts “peace” in the hands of a loving mother and has her assert that it is in the present that African Americans—particularly children—can actualize their dreams. Lastly, Space is the Place (1972) , is a musical exploration of Sun Ra’s space world. After journeying through cacophonous horns, offkilter piano, and energetic percussion, the album ends with the electronic beeps and bops of Ra’s spaceship taking off for another voyage.